$12K Will Make You Rich, if you invest $2,000 a year in a tax deferred account for six (6) years. It is just that easy or is it? Do I have your attention? What do you need to do? I feel a little bit like the guy in The Graduate when he pulls aside Benjamin Braddock at his party and he says he has one word of advice. In the movie, it was plastics! When talking about money and investing, there are two words. Compound interest is an integral part of investing. Although investing can include investments that earn interest, this is how your investments grow over time. Investments earn interest or appreciate and add earnings to the original investment. The original investment plus the earnings appreciate every year it is invested. Money or Your Life chronicles how I invested early which allowed me to achieve financial freedom. The most important step to wealth is starting early. How early do you need to start? If you could open an IRA at birth, do it! Since you do not work as soon as you are born, everything is dependent on your parents. It would be great if you could pick rich parents who would start an IRA for you. Since this is unlikely, we go straight to Plan B. Start investing as soon as you can when you start working. Many teenagers start working at sixteen (16) years old, but will you invest $2,000 for retirement? It is more likely when you have your first professional job following college or post secondary training. If you invest early, you have the advantage of more years to make the money grow. This is the power of compound interest. The real power is the number of years for your investment to grow. If you start early, you will have close to forty (40) years for your investments to grow. The amount of growth can vary, but over the very long term the stock market averaged 8-10%. Will you earn more or less than that doesn’t matter, if you invest early enough. The interest or appreciation is the amount of growth per year. Investing regularly is important. Investing on a regular basis is called dollar cost averaging. This is an investment strategy where you purchase shares of stock or mutual funds using a set amount of money on a regular basis periodically ($100 monthly). This way you buy more shares when prices are low and fewer shares when prices increase. In the long run, you lowered the average cost per share of the investment. The growth of your investment is the difference between your cost and the value of your investment. Adding to your investments on a regular basis, weekly or monthly will build wealth. Reinvest your dividends and purchase more shares of stock or mutual fund. This will help your investment grow faster. Buying more shares expands your base adds to your investment over time. As the price increases, your investment will grow faster through your reinvestment of dividends. 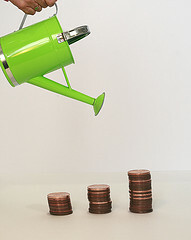 The more frequently you can add to your investment, the faster your investment grows. These strategies will increase your investment and help you reach your financial goals. If you start early, you can invest as little as $2,000 per year for six (6) years at 12% interest, you can accumulate more than $1.1 million. This is the power of compound interest over time (40 years). Reduce the interest or change the term, your investment grows over time. Starting early helps grow your investment more than the interest rate. Investing early puts time on your side. Waiting to invest will significantly reduce the amount of growth. You can improve your investment returns by investing regularly and reinvesting dividends and capital gains. Investing in a tax deferred account allows you to invest all your money without paying taxes until you withdraw the funds. In most cases, you will be in a lower tax bracket when you withdraw your funds. What are you going to do? $12K Will Make You Rich, if you invest early. $12K Will Make You Rich, if you invest early. 20’s Finance hosted the Yakezie Carnival and included Break the Rules! I agree that it can make you rich, but you also have to be pretty lucky to get 12 percent interest every year! I couldn’t agree more though that you need to start early. The compound interest is a huge part of it, but so another part of the equation is learning to live without the money you save! Time is much important than the return! Starting salaries for new college grads are around $50K, $40 per week is the cost of lunch five days a week. No excuses! So true KC! I wish I knew the magic of compounding when I had my first job! And to add to your advice, if you are a new parent, give your child a headstart by gifting ibonds. For teens, if they have traceable income, invest in a roth. I helped my children learn investing as preteens. It gave them a leg up on learning what to do with the savings they learned to do very young. It really is amazing to see how the little stuff can really add up over time. The earlier you start the better and this is why my hubby and I have made investing a priority. Time is more important than your choices, returns and just about everything else. As a kid I used to get very excited about these simple strategies to secure the future financially. Unfortunately I always found a reason to spend my money. You need a compelling reason to keep you on track and overcome the other reasons not to do it! I learned to invest at a young age… and continue the tradition now. The only difference is I’m more active, avoiding down turns and taking advantage of uptrends. Certainly invest outside any tax – we have ISA’s in the UK. But beware inflation which can hit. Stocks and shares can go down as well as up, which is curious given the amount of money that banks print. There is two kinds of inflation, one is the declared kind where the Fed raises interest rates to keep it down, the other is real inflation in prices. In the U.S., the government separated food and oil because they are commodities. Everyone is affected by food/oil price fluctuations and it is inflationary even if they do not count it. In my example, time is more important than anything! I am a far from active investor, but I do look for growth opportunities. So am I, but time trumps them all! You are absolutely right! Start early to get the advantage. I’m not sure if you can get 12% of annual return rate for 40 years. I would say maybe 8%. You are right, however even 8% will give you a great return. The real message is time trumps everything! The most powerful aspect of compound interest is time. It trumps everything else. It compensates for volatility, mistakes and just about everything else. Nah! If they did, you probably would not be as motivated! 🙂 If I do it for my future grandchildren, I will tell them until they are adults. 12k! I’ve read all these articles about compound interest, but 2k a year!!? O_o I need to seriously look into setting up some sort of investment contribution again ASAP. This is the point of this article, time trumps everything else! Yeah very true. The power of compound interest. 2k from your yearly blog income can go to this account, right? I max out my 403B from my regular income. Besides I do nt have 40 years to make it grow. The rule of 72 is a powerful thing. And the more you accumulate, the faster it grows. Time is the strongest factor in this equation. Time is so important to creating wealth, but most of us make excuses for not doing something sooner. The sooner you can put money to work for you, the bigger the reward you see in the end. So simple it is hard to believe! There are many reasons for not participating in a 401K when you are young. I think if you look at it as just putting aside $40 per week for your future, it is much easier to comprehend. It can’t be overemphasized that using time and compound interest to your advantage is the best way for most to develop wealth. Amen! The sooner you startthe better off you will be. But those broker fees can hurt you if you invest too often right? You gotta find a way to balance it out by investing maybe once a month? I usually avoid fees by investing in no load mutual funds or use a discount broker. I admit it: you lured me with your title. But having read the post, I cannot dispute the power of compound interest. Now…how do we get all of these 20 year olds to start NOW? The simple answer is the parents need to convince them. I think nothing else works! I didn’t start investing for retirement until my second job out of college, though now I put in as much as I can (currently about 12% of my income) to retirement accounts to make up for lost time and build for a strong future. Good for you! The earlier you start the better off you are. It provided opportunities for me to achieve financial freedom at 38 years old. I wish I had started investing when I was younger. Could have better utilized time. Too late to redo, but making the most of the time I have now and retirement vehicles like 401k’s and IRA’s. Great message to spread to the younger folks! If everyone would get into the saving habit, you would avoid a lot of the pitfalls and have greater choices in life. People are always surprised when you start crunching the numbers for them, but people look at forty years and say “I’ll start next year.” It’s time to stop the short sightedness and truly start planning for the future. I’ve heard many people say that they don’t want to invest in the stock market because it took such a bad fall, then I point out how that is the time to invest. Will I guarantee that things won’t get worse in the future? No way! but when the price is cheaper you buy. I don’t like picking tops and bottoms because it’s difficult to do it properly, and it’s a guessing game if you do it easily. Dollar cost averaging is the best way to go for more people. If you’ve invested in fundamentally good companies, then it doesn’t matter if the market is down, just buy your companies when they’re on sale. Frankly, I am not skilled enough to time the market! The point of compound interest is time trumps everything else. You can make mistakes as long as you start early! The next most important ting to do is add to your investment regularly. When the market is going up and going down. I’m right there with you on market timing! What you describe is what people have trouble understanding. When you put $200.00 into a stock, but only see about $2 worth of appreciation at the end of the month, it’s hard to believe that eventually that appreciation will blow your principal out of the water. It’s all about time. The rules can change on tax-deferred accounts at any time. Pay your taxes now and be done with them. I have a variety of accounts, IRA, 403B, Roth IRA and brokerage accounts. I have more control of the impact of taxes that way. I personally never used lending club. I made my money in rental property and now the stock market. I use the Buffett philosophy of investing in what you kow and understand.